Patient with lap band and 100 lb weight loss. 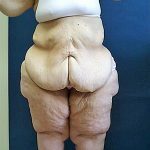 She presented with excess skin in the abdomen,thighs, and buttocks. She underwent total body lift, longitudinal medial thigh lift, and auto augmentation of the buttocks..
Bariatric patient with body lift and back lift. 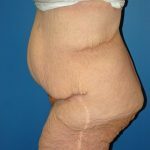 Gastric bypass patient with body lift and longitudinal medial thigh lift. Bariatric patient with body lift and auto augmentation of the buttocks. Weight loss patient with body lift and auto augmentation of the buttocks. Her right buttock developed a small area of necrosis which healed without surgery. Gastric bypass patient with total body lift and longitudinal medial thigh lift. Lap band male patient with greater then 100 lb weight loss who underwent body lift and longitudinal medial thigh lift. Note feminine appearance of hips prior to surgery. Post operative result shows a more masculine appearance following resection of fat from the hips. 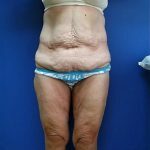 Gastric bypass patient who underwent abdominoplasty and debulking of lower extremities with liposuction. Lap band patient who lost nearly 300 lbs and was unable to exercise due to a large abdominal flap. She was turned down for surgery by two different plastic surgeons. After clearance for surgery was obtained, she underwent an abdominoplasty with removal of 50 lbs of tissue.